1) Tell us a little about yourself and your background? I am a true blue Mirandian, who loves travelling and writing. 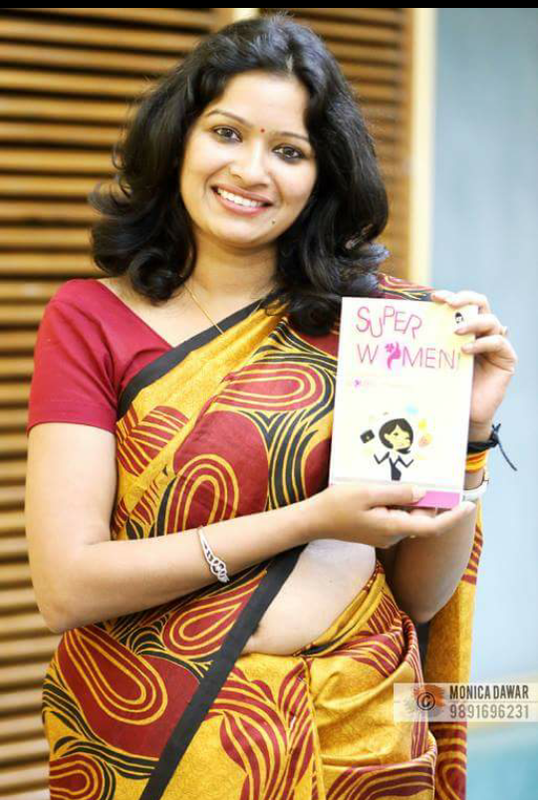 During my MBA from Great Lakes Institute of Management, I started HYPERLINK “www.Ghoomophiro.com” http://www.Ghoomophiro.com, it was that time, I faced few challenges, and this actually made me to interact with few of these inspiring ladies, which I penned down in superwomen. At ghoomophiro, we organize solo women travel and corporate team events. The USP of organization is that we do not have fixed packages. Instead, we curate each and every trip based on our client requirements and interest areas. I also go out for workshops on entrepreneurship and take up lectures on the same with e-cells of various management and engineering colleges. 2) When did you first realize you wanted to be a writer? I think, writing is in my genes. Since my childhood, I used to write about my thoughts in letter to editors column of various magazines. I always thought to write and infact, I started a fiction some years back, which I left in between. May be I will complete it in few months and revisit it. 3) How long does it take you to write a book? Superwomen took almost an year to complete, but final product came out after 2.5 years as I took more than 6 months to find a publisher being the maiden author. Thanks to Shristi Publishers for showing trust and confidence in my writing despite me being a debut author. 4) Which writers inspire you? I always like inspirational writing. This is the reason, I enjoy reading Sudha Murthy, Richard Branson, Paulo Coleho. Most of their writings have some deep message that inspires you to dream big and execute your dreams. Their books can be easily related to our daily lives. 5) So, what have you written? 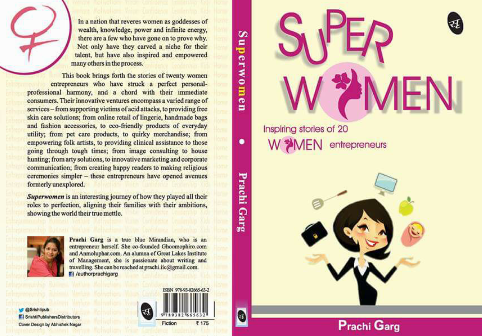 Book is available in leading book stores and on HYPERLINK “http://www.amazon.in/Super-Women-Prachi-Garg/dp/9382665633&#8221; Amazon. Book is also available on Kindle. My debut book Superwomen is a collection of journeys of 20 women entrepreneurs who made big in their lives at an early age. It encompasses their journeys, challenges and their unique way to overcome them. I have been fortunate enough to interact these women entrepreneurs and learn something from them. Another USP of the book is the variety genre of the business these women are into. On one hand, book has stories of Richa Singh from your dost, Medhavi Gandhi from happy hands from social fields, whereas Richa Kar from Zivame and Anisha Singh from Mydala; both from e-teller market has been featured. Each story is unique in its own. I strongly feel, every woman who aspire to do big in her life should read the book. Besides this, I also write on women related forums like your story on women entrepreneurship. 6) How can readers discover more about you and you work? 7) What is the hardest thing about writing? 8) What about your next book? My next book “Better Halves of Start-ups” is the journey of couples who chose to start something on their as cofounders. This book brings out the ups- and downs in relationships when your better half becomes your professional buddy too. It has been observed that in relationships where couples partner up in building their own enterprise, an equation of deep thoughtfulness for each other’s situation build naturally. For people working in different environments, it often becomes difficult for the counter-parts to understand and appreciate each other’s circumstances of both achievements and challenges.However, couples who are starting up together know exactly what the stress of risks and decisions are, understand the excitement of each big and small milestone accomplished on the way and can share the emotions more intently. It is also very natural then, that circumstances at home also become a lot more compatible and equal. Sharing of responsibilities, time and opportunities is far more appreciable when the principle emotions are conjoined. This is what gets many relationships to fruit stronger after coming together at a professional front. Bursting the myth of risks involved with such association, the rising trend is dismissing the traditionally declared threats of mixing work and home. However, the new-age think tanks of the country are beaming with their spirit to create their own norms of what works, both in their personal and professional equations, inspiring many dreams in the lives of those who have not yet dared. “The better half of start-ups” brings out such lovely stories of 20 enterprising couples. #Readon. 9) Any message for new authors? Don’t get disappointed with initial rejections. As first time authors, it is likely to get rejected by publishers. Take their feedback in positive way and work on your manuscript. There could be low moments, but be confident on your concept and take it forward with full enthusiasm. ← Do parents make the best teachers?